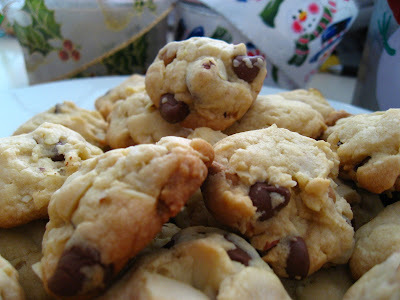 Gert ... are you bringing these cookies to the party? If yes, the guests will probably start with dessert instead of salad or appertizer. Lucky folks! wah....your cookies always look good man!! 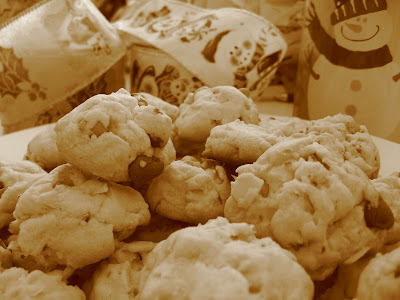 !hmmmm...must start baking this few day...have to catch up with you..hehehe!! Gert, I got my new oven alreadylah..can bake and roast and what not..dah two nights in a row, me and kids makan roast chicken.. he he he..lepas tu siap masak kul 11:30pm.. hah gemuklah nanti..
Bolelah try recipe ni, lagi pun my daughter bought chocolate chip yesterday..
Oh this is so delicious.... shall we exchange....lol! Alah gert lupa nak tanya. Dalam melayu basil leaf tu apa ya? BBO, by the time the cookies reach you it will not be fresh anymore :) I want your macaroons. Ummi, boleh lah masak best best with your oven baru. Set up satu blog so I can pergi tengok gambar your masakan :) Basil in BM if not mistaken is Daun Selasih. Yup, time of the year to put on pounds too. But who cares ! Yatie, with a new baby memang susah nak masak. How is the baby doing? Gert, he's doing great and thank you for asking. I add your page as my favorites coz' it has great recipe (air liur meleleh) lol.